Darrell, Nolan and Paulette with catch! 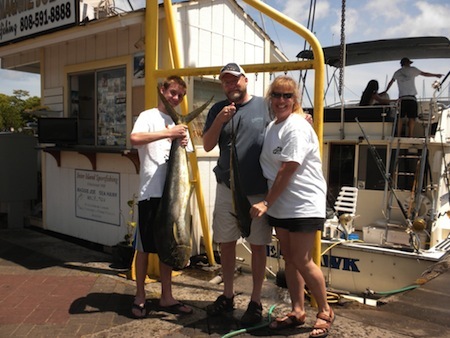 Mahalo to Darrell, Nolan and Paulette for choosing Maggie Joe Sport Fishing! The family joined us aboard the Sea Hawk on a sport fishing charter! Nolan hauled in this nice 23 lb Female Mahi Mahi! Aloha! The Hardin Family with 8 Mahi Mahi! Mahalo to the Hardin Family for choosing Maggie Joe Sport Fishing! The group joined Captain Mark and Deckie Johnny-Bobo aboard the Maggie Joe on a sport fishing charter. They hauled in 8 tasty Mahi Mahi while deep sea fishing outside of Honolulu, Oahu! Aloha! Bobby, Eric, Miho, Ken, Tim, James and Nicole with Catch! Angler Bobby's 40 lb Bull Mahi Mahi! 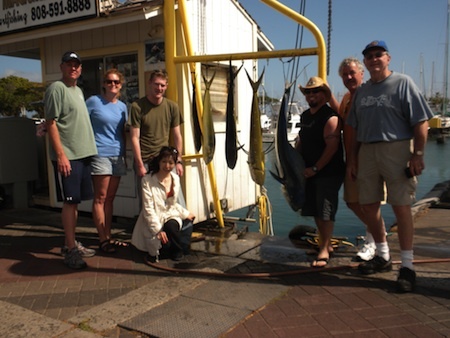 Mahalo to Bobby, Eric, Miho, Tim, James and Nicole for choosing Maggie Joe Sport Fishing! The group joined us aboard the Maggie Joe on a full day shared sport fishing charter with Captain Mark! They spent the day deep sea fishing outside of Honolulu, Oahu and hauled in 5 Mahi Mahi, including one big Bull Mahi Mahi! Congratulations and Aloha! 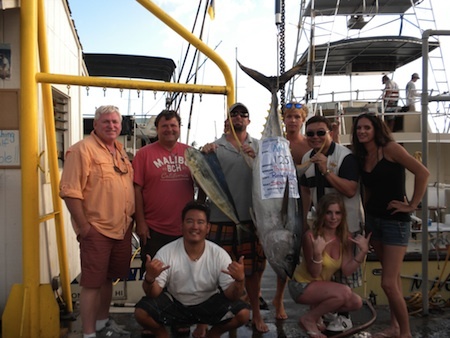 Angler Thomas with 125 lb Ahi, Noelle, Mike, Lebron and Sara with the Maggie Joe crew! 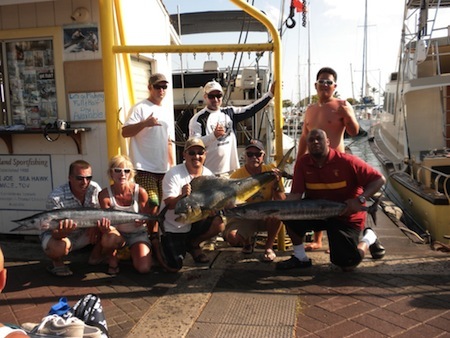 Mahalo to Thomas, Noelle, Mike, Lebron and Sara for choosing Maggie Joe Sport Fishing! The group joined Captain Randall and Mate Mikey aboard the Sea Hawk on a sport fishing charter. 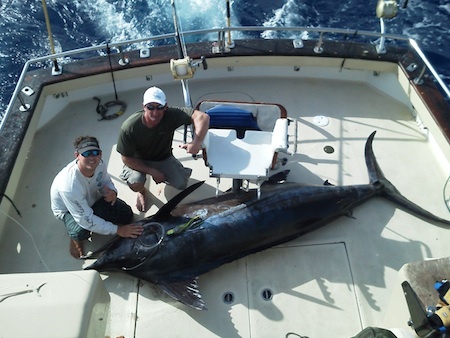 Thomas hauled in this 125 lb Ahi while deep sea fishing outside of Honolulu, Oahu. Aloha and Hana Hou! Lauren, Greg, Terry, Cindy, Jim and Branden with 21 Mahi Mahi! 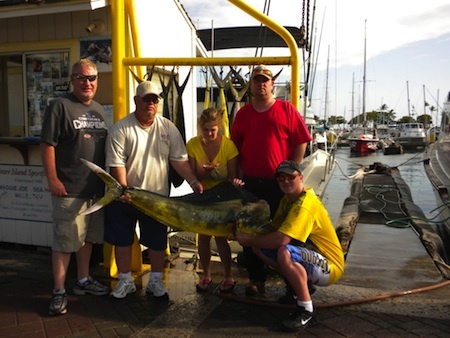 Mahalo to Luaren, Greg, Terry, Cindy, Jim and Branden for choosing Maggie Joe Sport Fishing! 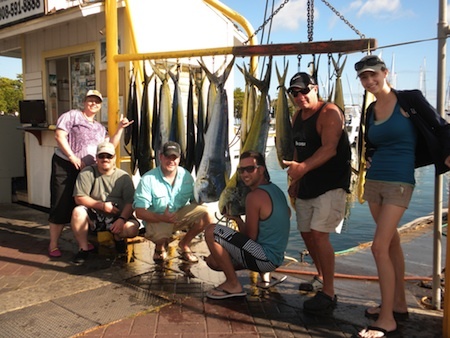 The group joined Captain Mark on a full day sport fishing charter aboard the Maggie Joe. After departing Kewalo Basin, next to Waikiki, they spent the day deep sea fishing outside of Honolulu, Oahu and hauled in 21 Mahi Mahi! Hana Hou! Bruce, Wyatt, Alan, William, Evan and Allison with catch! Bruce with Wyatt and his Ono! 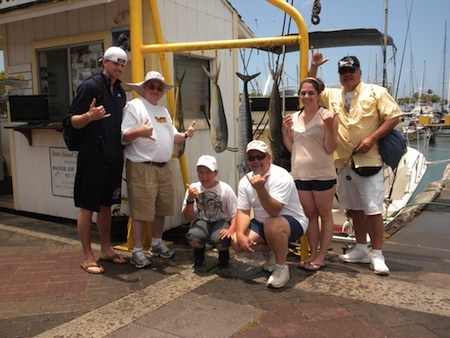 Mahalo to Bruce, Wyatt, Alan, William, Evan and Allison for choosing Maggie Joe Sport Fishing! The group departed Kewalo Basin, next to Waikiki, on a half day sport fishing charter aboard the Sea Hawk. They hauled in 2 Mahi Mahi and an Ono while deep sea fishing outside of Honolulu, Oahu! Aloha! Eugene, Carlos, Crystle, Johnathan and Michael with 40 lb Bull Mahi Mahi! 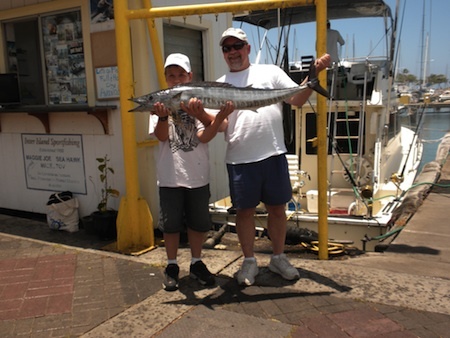 Mahalo to Eugene, Carlos, Crystle, Johnathan and Michael for choosing Maggie Joe Sport Fishing! 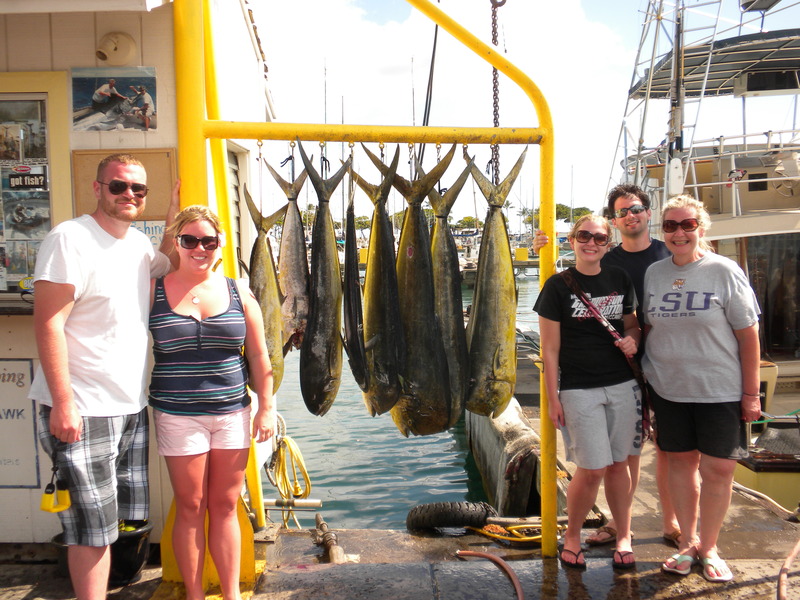 The group joined Captain Mark aboard the Maggie Joe on a sport fishing charter. It was a nice day out on the water as they hauled in a total of 9 Mahi Mahi and 1 Shibi while deep sea fishing outside of Honolulu, Oahu! The catch of the day is the big 40 lb Bull Mahi Mahi front and center in photo! Congratulations and Aloha! David and Jess with catch! 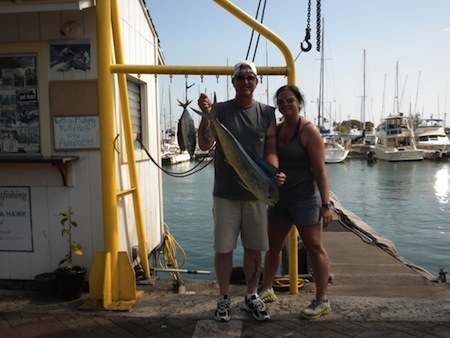 Mahalo to David and Jess for choosing Maggie Joe Sport Fishing! 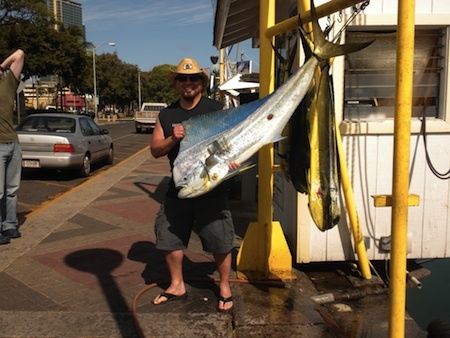 They hauled in a tasty Mahi Mahi and a pair of Aku while deep sea fishing outside of Honolulu, Oahu! Aloha! Randy, Chris, Steve, Shan, Mike and Sandy with their catch and Captain Mike Hennessy! Mahalo to Randy, Chris, Steve, Shan, Mike and Sandy for choosing Maggie Joe Sport Fishing! The group joined Captain Mike Hennessy on a sport fishing charter aboard the Sea Hawk. After departing Kewalo Basin, next to Waikiki, they spent the day deep sea fishing outside of Oahu, Hawaii. They hauled in 2 Ono and 1 Mahi Mahi! Hana Hou!